Once again it was about Trump, the US president's criticism on the strong dollar and his comments on FX manipulation fueled the risk for a trade war converting into a currency war. The USD/JPY was dragged below the 111 level after these comments due to the appreciation of the safe-haven currency and a strong US Dollar selloff. In addition, traders are speculating on BOJ's interest rate policy drifting its interest rate targets and the pair is trading further lower and ready to break an important trendline support. 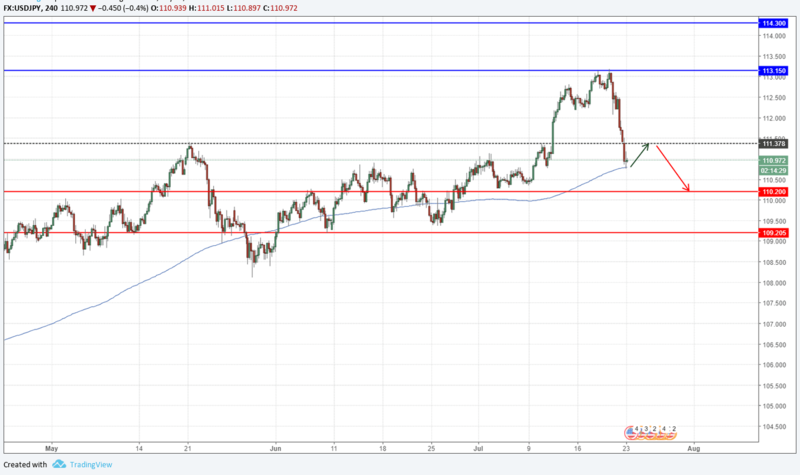 The USD/JPY is trading lower due to Trump's comment and broke under the 111 level trading around the 200-period moving average at the 110.90 level. A break under this level will be a turning point for the pair and could push it lower towards the 110.20 area. On the other hand, a pullback above 111.35 will lead towards last week's high at 113.15 .